In September 1916, the revolutionary British Mark I tank was first used in combat, ushering in a new era of mechanized warfare. Almost at the same time, French tanks Schneider CA1 and Saint Chamond went into service as well. But their performance disappointed the French Army due to their cumbersome bodies and very poor passing ability. Colonel Jean-Baptiste Eugene Estienne (1860-1936), who’s known as the father of French tanks, proposed to develop a less expensive light tank with good passing ability. The tank could also be used for accompanying the infantry into combat. 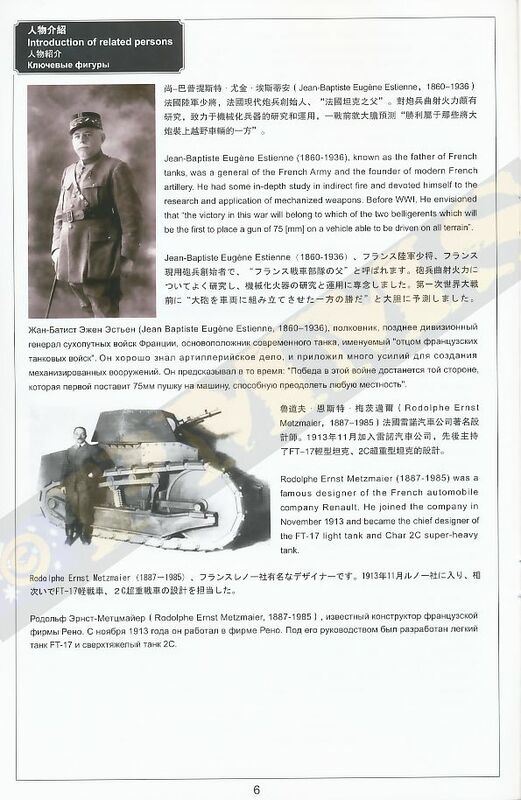 In June 1916, Colonel Estienne contacted Louis Renault to convince him to develop a new tank, but Mr. Renault refused. The reason was that it’s quite difficult for the Renault Company to do so since they were never involved in tank development before. 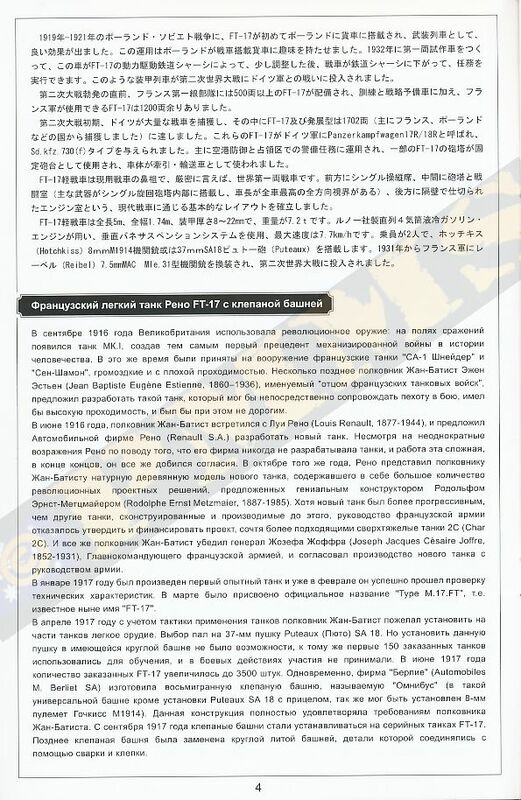 However, Mr. Renault accepted this request at last. 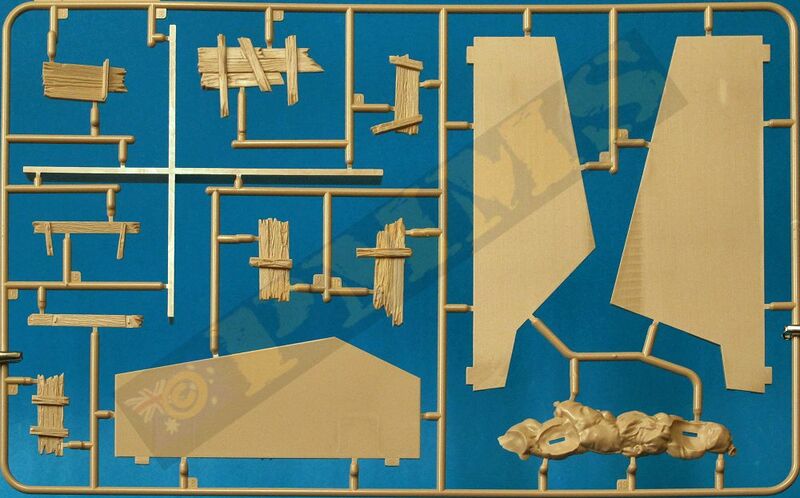 In October of the same year, Mr. Renault showed a full-scale wooden mock-up of the tank to Colonel Estienne. 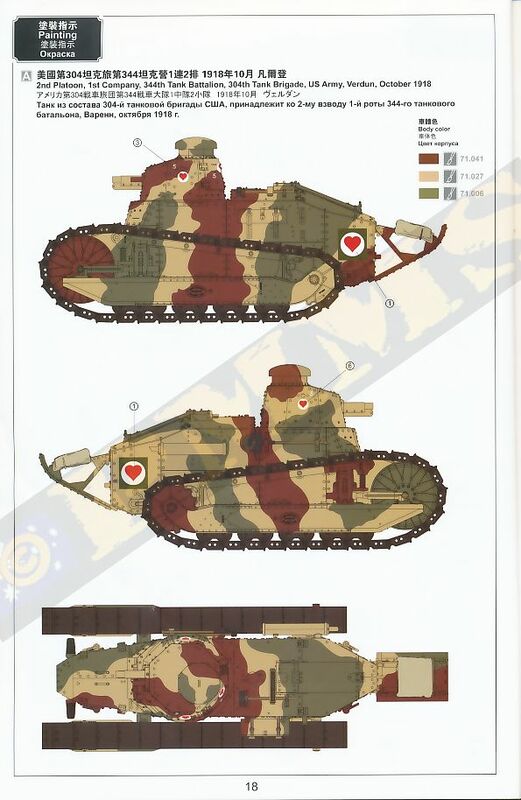 Many revolutionary designs of this tank were created by the talented designer Rodolphe Ernst Metzmaier (1887-1985). 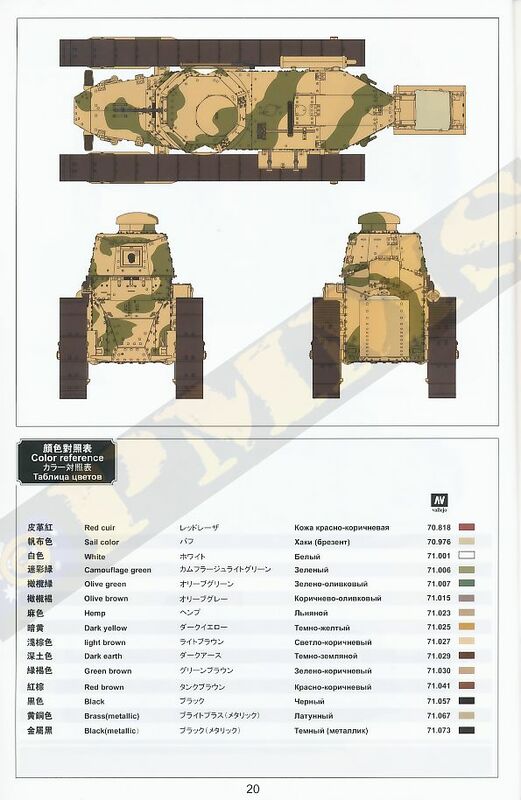 Though the new design was technically far more advanced than other countries’ tanks, top officials of the French Army refused to approve the project or allocate funds because they had more interest in the Char 2C super-heavy tank. Consequently, Colonel Estienne appealed to General Joseph Jacques Cesaire Joffre (1852-1931), Commander in Chief of the French Army, for support. At last, the Army agreed the production of a prototype. The first prototype was unveiled in January 1917 and it passed the workmanship test in February. 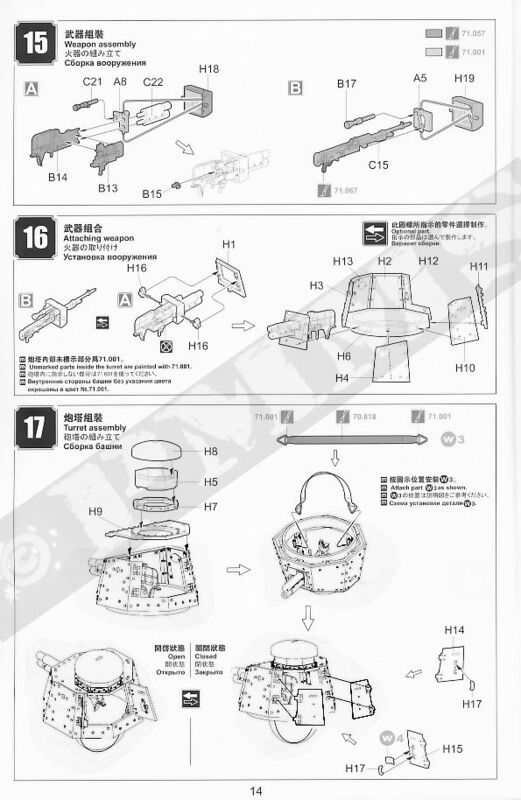 In March, it was officially designated as “Type M.17.FT”, better known as “FT-17” later. By June 1917, 3500 FT-17s had been ordered, but mass production didn’t start until September because many technical problems needed to be solved in the initial production stage. 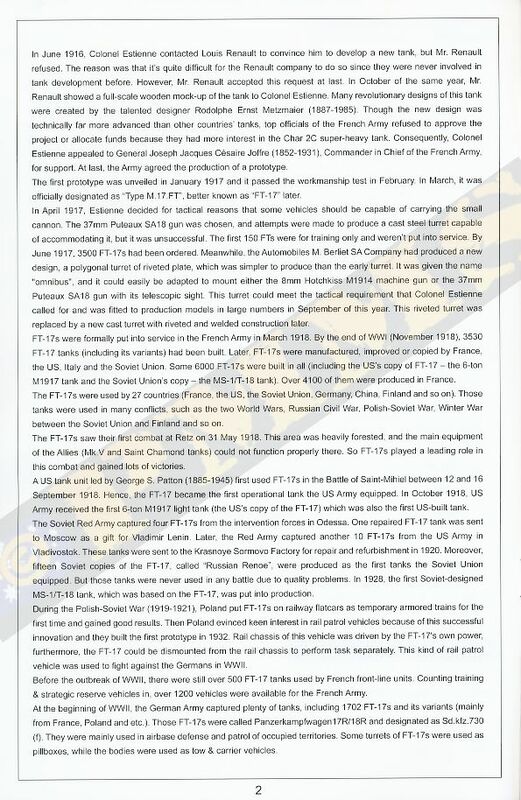 FT-17s were formally put into service in the French Army in March 1918. 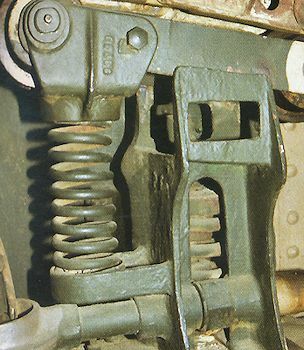 During the early days of its service, the FT-17 was fitted with a riveted turret which had some disadvantages, such as complex manufacturing process, poor bullet-proof properties and failure to achieve a full rotation. Later, a new cast turret with riveted and welded construction was developed by Forges et acieries Paul Girod. 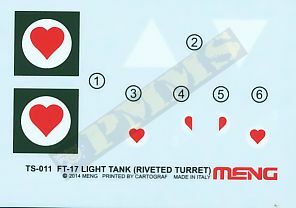 The new turret which was manufactured with a simplified process could achieve a full rotation, and it helped improve the tank’s overall performance. By the end of WWI (November 1918), 3530 FT-17 tanks (including its variants) had been built. Later, FT-17s were manufactured, improved or copied by France, the US, Italy and the Soviet Union. Some 6000 FT-17s were built in all (including the US’s copy of FT-17 - the 6-ton M1917 tank and the Soviet Union's copy - the MS-1/T-18 tank). Over 4100 of them were produced in France. The FT-17s were used by 27 countries (France, the US, the Soviet Union, Germany, China, Finland and so on). Those tanks were used in many conflicts, such as the two World Wars, Russian Civil War, Polish-Soviet War, Winter War between the Soviet Union and Finland and so on. 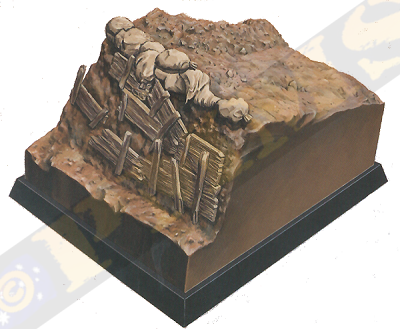 The FT-17s saw their first combat at Retz on 31 May 1918. This area was heavily forested, and the main equipment of the Allies (Mk.V and Saint Chamond tanks) could not function properly there. So FT-17s played a leading role in this combat and gained lots of victories. A US tank unit led by George S. Patton (1885-1945) first used FT-17s in the Battle of Saint-Mihiel between 12 and 16 September 1918. Hence, the FT-17 became the first operational tank the US Army equipped. In October 1918, US Army received the first 6-ton M1917 light tank (the US’s copy of the FT-17) which was also the first US-built tank. The Soviet Red Army captured four FT-17s from the intervention forces in Odessa. 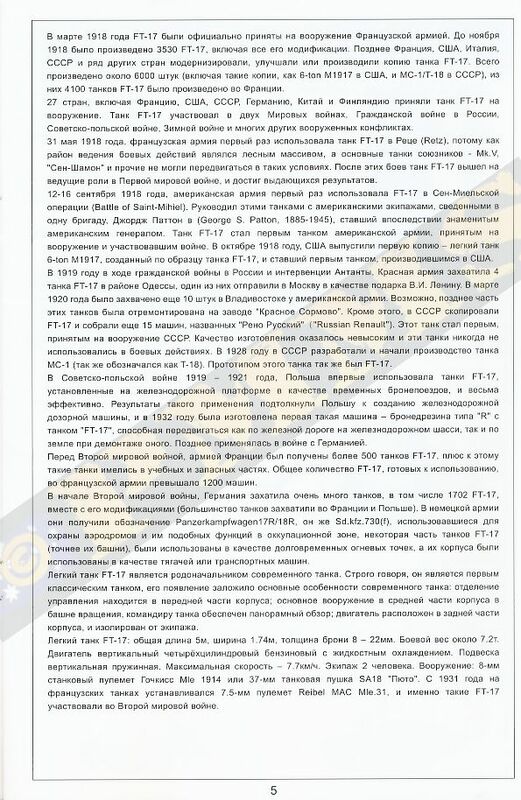 One repaired FT-17 tank was sent to Moscow as a gift for Vladimir Lenin. Later, the Red Army captured another 10 FT-17s from the US Army in Vladivostok. These tanks were sent to the Krasnoye Sormovo Factory for repair and refurbishment in 1920. 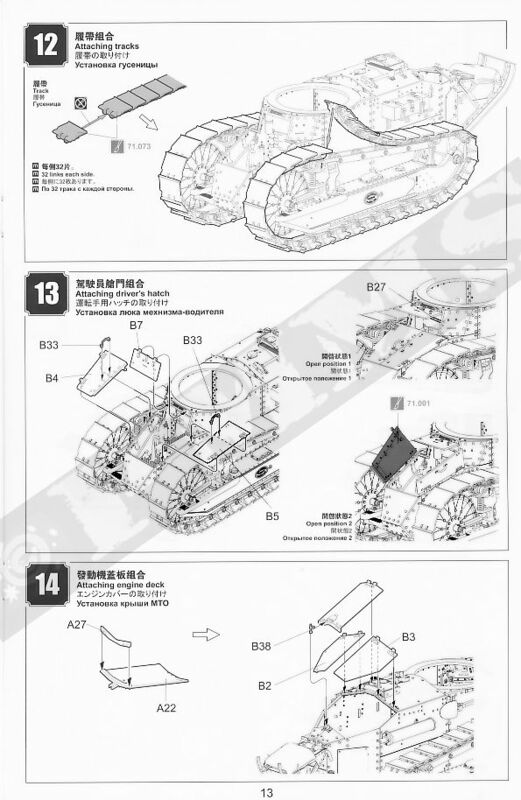 Moreover, fifteen Soviet copies of the FT-17, called “Russian Renoe”, were produced as the first tanks the Soviet Union equipped. But those tanks were never used in any battle due to quality problems. 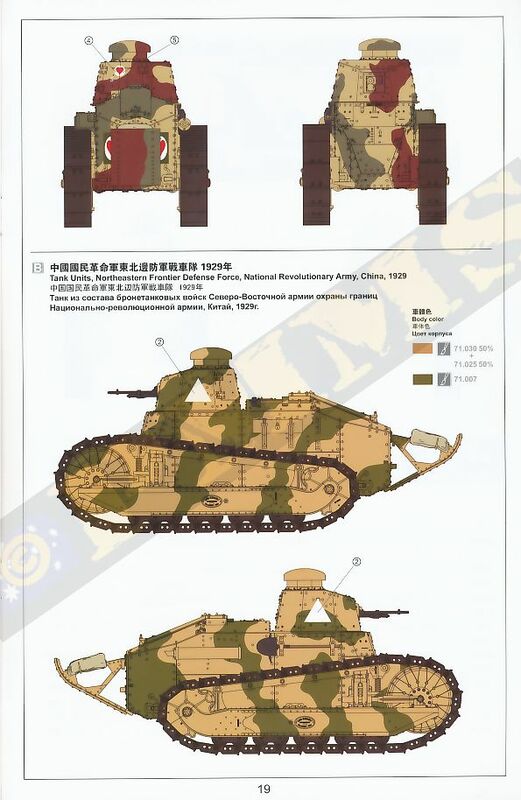 In 1928, the first Soviet-designed MS-1/T-18 tank, which was based on the FT-17, was put into production. During the Polish-Soviet War (1919-1921), Poland put FT-17s on railway flatcars as temporary armored trains for the first time and gained good results. Then Poland evinced keen interest in rail patrol vehicles because of this successful innovation and they built the first prototype in 1932. Rail chassis of this vehicle was driven by the FT-17's own power, furthermore, the FT-17 could be dismounted from the rail chassis to perform task separately. This kind of rail patrol vehicle was used to fight against the Germans in WWII. During the Winter War between the Soviet Union and Finland (1939-1940), a small number of Finnish FT-17s were dug in as strong-points to stop the Soviet Red Army attack. Vehicle No.4 from the 2nd Tank Company was captured around Pero railway station by the Soviets. This tank was used by the Soviets after being painted with white color on its previous tri-color camouflage. 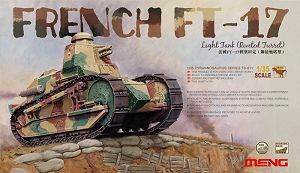 Before the outbreak of WWII, there were still over 500 FT-17 tanks used by French front-line units. Counting training & strategic reserve vehicles in, over 1200 vehicles were available for the French Army. At the beginning of WWII, the German Army captured plenty of tanks, including 1702 FT-17s and its variants (mainly from France, Poland and etc.). Those FT-17s were called Panzerkampfwagen17R/18R and designated as Sd.kfz.730 (f). They were mainly used in airbase defence and patrol of occupied territories. Some turrets of FT-17s were used as pillboxes, while the bodies were used as tow & carrier vehicles. 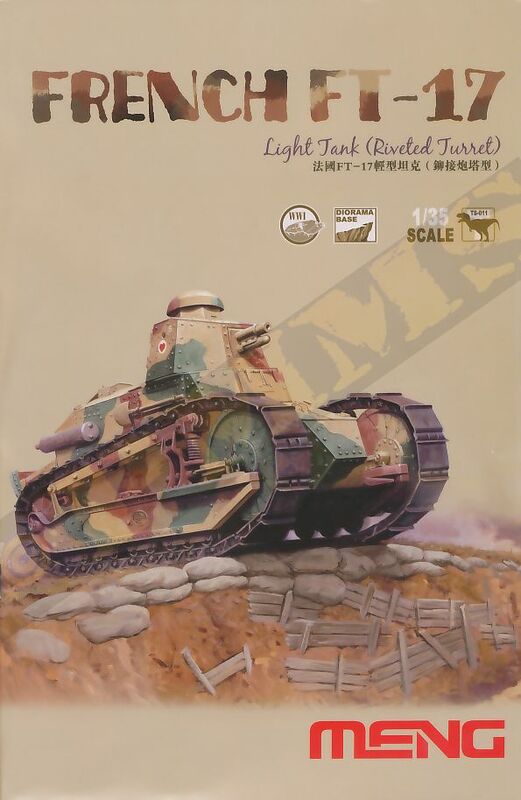 The FT-17 light tank was the ancestor of modern tanks and was the first real tank in the world in strict sense. 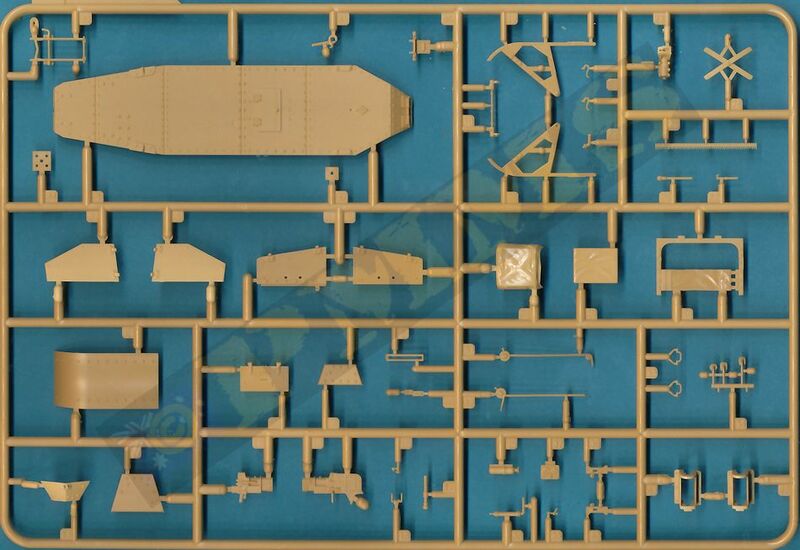 Its configuration - crew compartment at the front, main armament in a central single turret, a fully rotating turret on the top, full-view commander compartment, separate engine compartment at the back has become and remained the standard modern tank layout. 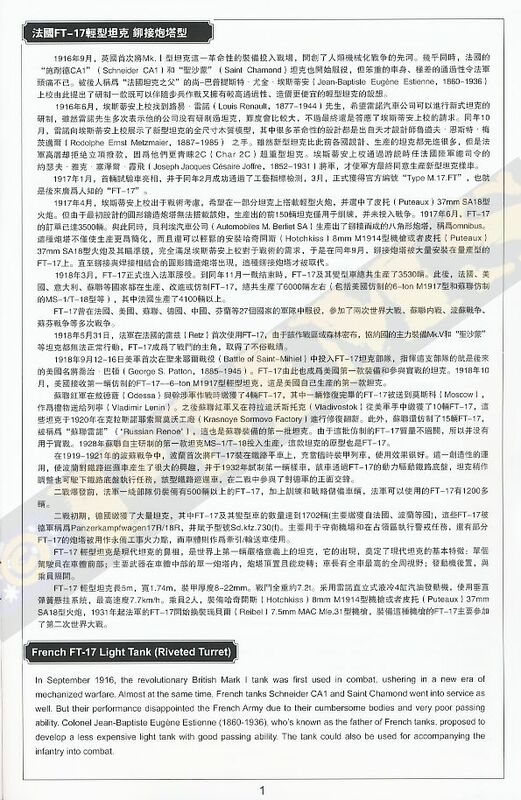 The FT-17 light tank was 5m long and 1,74m wide. 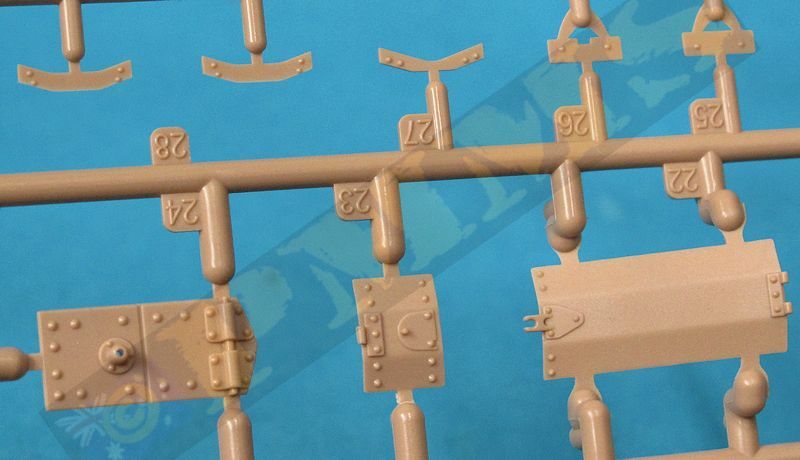 Its armor varied in thickness from 8mm to 22mm. Its combat weight was 7.2t. It was powered by a Renault 4-cylinder inline liquid-cooled petrol engine. 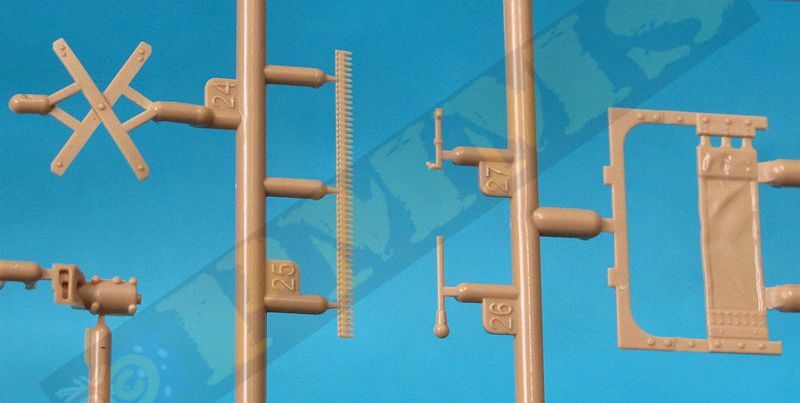 Suspension system consisted of vertical springs. The tank could reach a maximum speed of 7.7km/h and accommodate a crew of two. It was armed with an 8mm Hotchkiss M1914 machine gun or a 37mm Puteaux SA18 gun. FT-17s of the French Army were upgraded with 7.5mm Reibel MAC Mle.31 machine gun from 1931 onwards. Those tanks were primarily used in WWII. 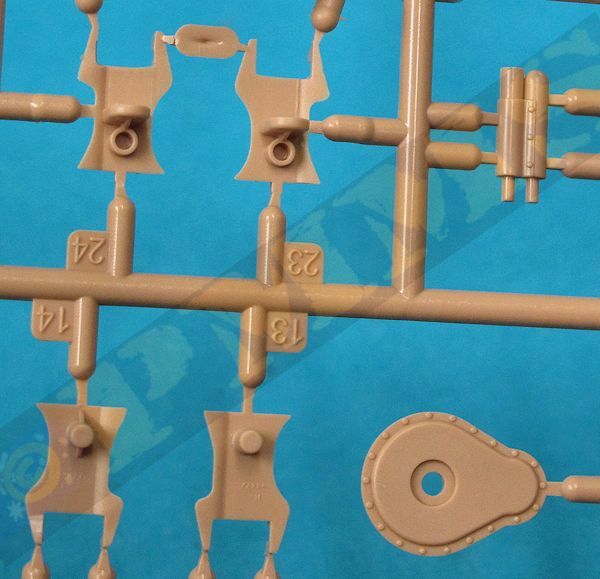 The kit follows the previous FT-17 Cast Turret (kit TS-008) and is basically the same kit with the inclusion of the Riveted turret in place of the cast turret plus a large diorama base to sit the finished model on if your wish. The other difference is this new kit only includes the interior Driver’s station but not the engine, transmission or radiator for a more basic interior fit out. 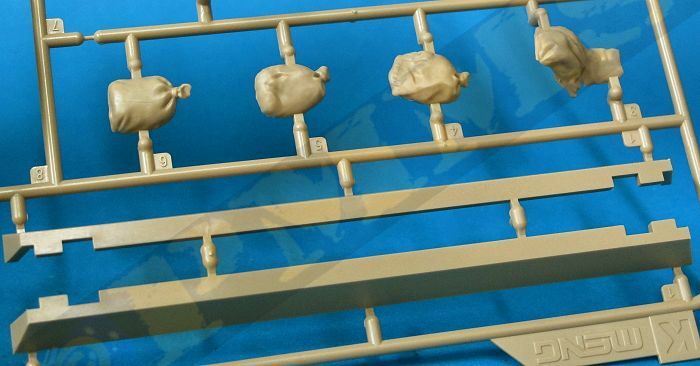 The standard of moulding is excellent and virtually flash free although there is a very small amount of fine flash on some parts and the usual moulding nodes to be removed along with very fine mould lines on the parts. 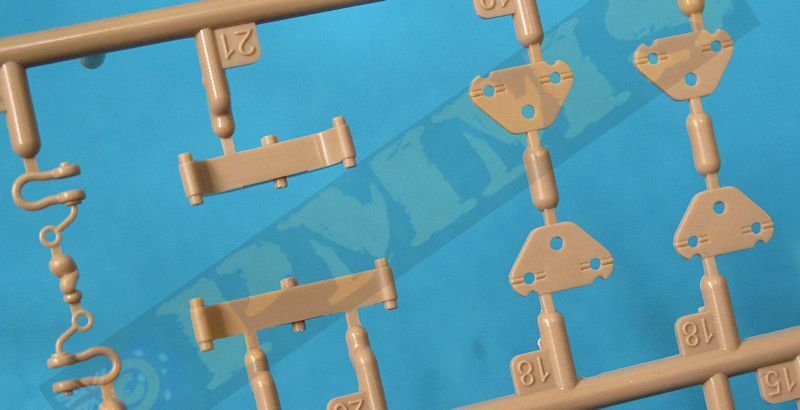 Pin marks are at a minimum and most are hidden after assembly so check the instructions before spending time filling marks that will not be visible. 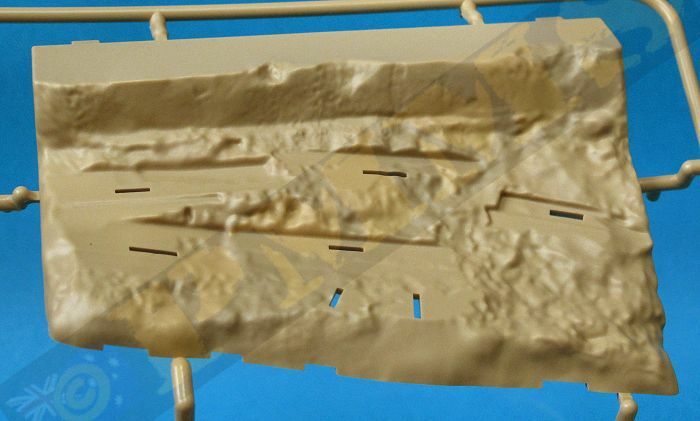 Some of the pin marks on the larger hull parts had raised residual plastic from the moulding process that will need to be trimmed smooth to ensure proper assembly. 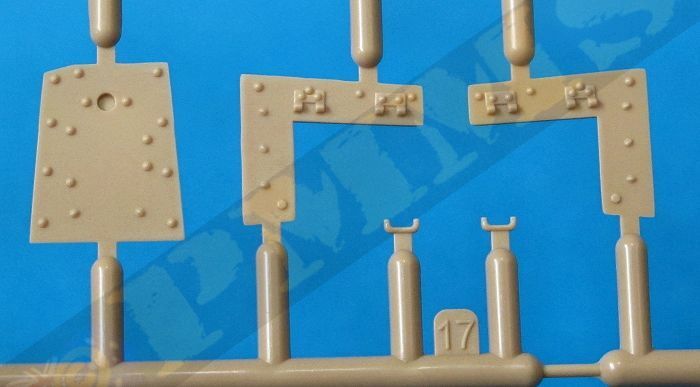 Surface detail is excellent with hundreds of raised bolts/rivets on the turret and hull panels as well the distinctive Renault oval badge on the side suspension sponsons. On the actual vehicle some of the larger hull rivets are not perfectly round but have small flat edges on either side to allow the rivet head to be gripped during construction, while others appear to be round in profile. This is only noticeable when viewing the hull rivets in close up photos and looking at most B&W period photos taken from ‘normal’ viewing distances it’s very difficult to notice the rivets are not round in profile. The kit hull rivets are round in profile (apart from a few under the turret ring side overhang) but while not technically correct given the scale size is fairly small unlike the huge rivets on the side of a Churchill for example and the scale appearance it’s a difficult thing to notice as you need to use a magnifier to see the rivets in close-up anyway. 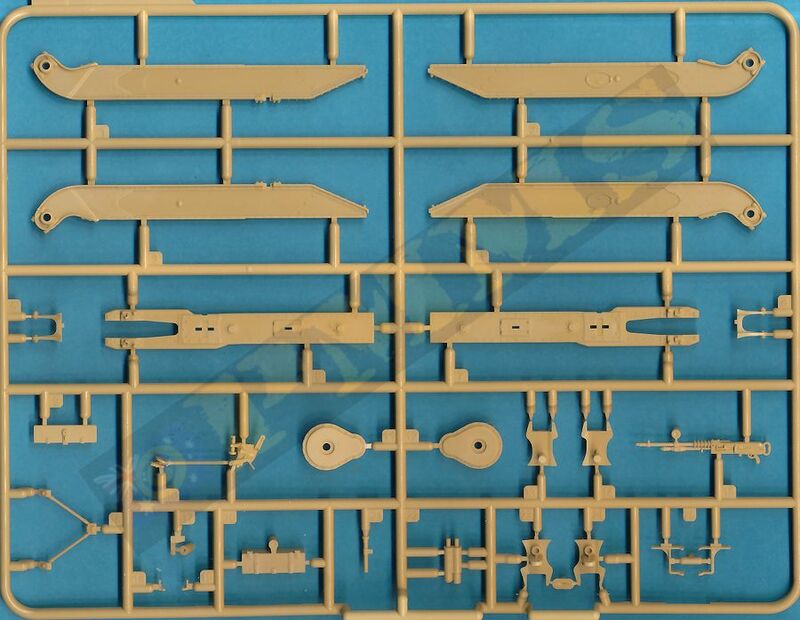 But as always the final decision is up to the modeller if they think this is an issue or not with the kit details? 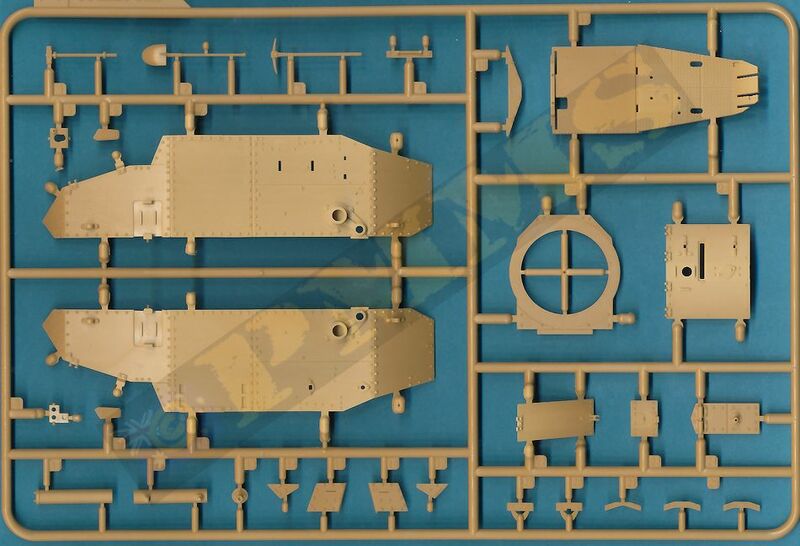 Hull details include the full driver’s compartment details with tread plate floor for both the driver’s and central fighting compartment floors but as mentioned only the front Driver’s station details are included with this kit and the large front and rear hatches can be shown open to expose most of the detail if you wish. 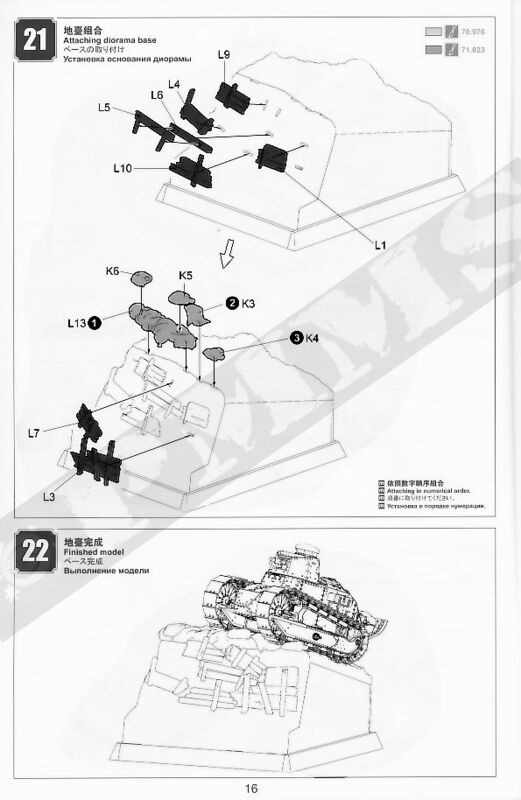 There is also working suspension and track along with alternate large wooden or metal idler wheels at the front, and the turret interior includes the gun breech and mountings with a choice of two armaments for the turret, the 37mm Puteaux SA18 gun or the 8mm Hotchkiss M1914 machine gun which also comes with a ground tripod and can be used as an infantry support MG if not fitted to the turret. 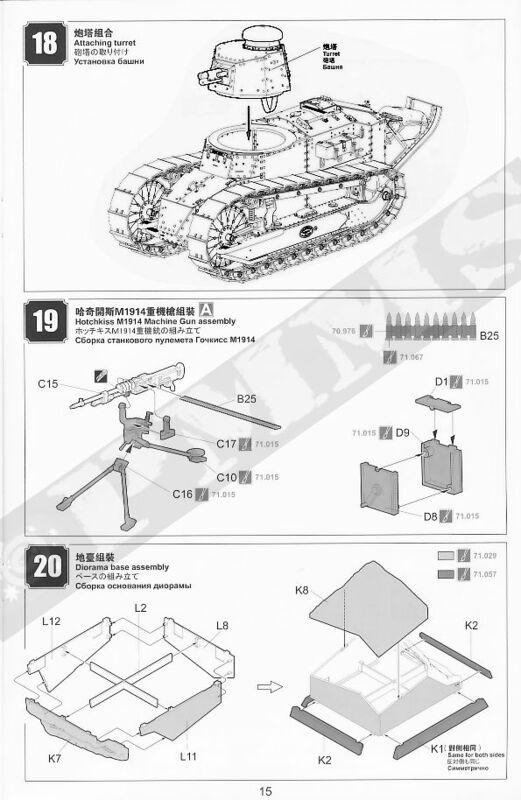 Dimensionally the kit measures out very well to the 1:35 plans in the Armor PhotoGallery #15 Renault FT book in all the main areas such as hull, turret and suspension/track parts with any discrepancies well within accepted tolerances taking into account the printing processes etc. The hull itself is made up of separate panels for the floor, sides, front, rear and top plates with the floor plate having internal bolt details and added to this is the driver’s foot pedals, gear lever and steering levels. The raised driver’s compartment floor has tread plate pattern included with cut-outs for the foot pedals and steering levers along with the driver’s seat and backrest, there were no fit problems with any of these parts with everything fitting nicely. 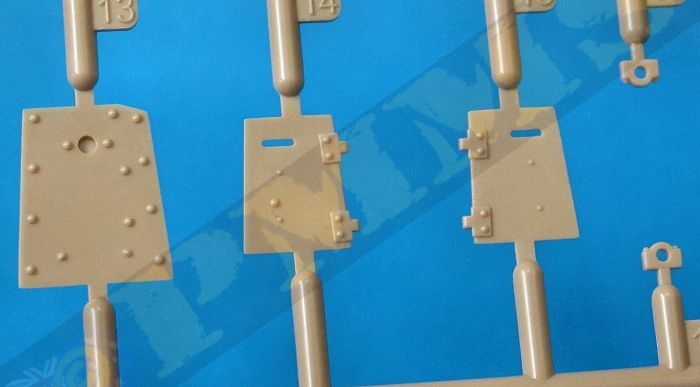 The two hull side plates have excellent rivet and other details on both sides without any pin marks that will be exposed after assembly, as mentioned some need to be smoothed out to allow proper fitting of other details. The small driver’s instrument panel is also attached to the left hull side and you can fit the outside hull side detail before fitting the panels to the floor as per instructions, I didn’t attach the tools as these were prone to damage during handling but the storage box with mountings, muffler, the front crew steps and tow eyes can all be fitted. Just a quick note on the tow eyes (parts D22) these have rings moulded on the ends of the pin bracket but the majority of period and museum photos of the eyes don’t show these rings, just the pin itself so cutting off these rings would be appropriate. The suspension mounting housing (parts B41, B42) have the metal suspension arm with larger spring fitted inside the housing and I needed to enlarge the cut-out in the housing top to fit the metal arm better. Also the spring supplied is way too fine with not enough coils compared to the actual spring which is thicker gauge and replacing the spring or making one from thicker wire will improve the appearance here. The two hull side panels are first fitted to the floor and the join edges of both are bevelled to eliminate any join lines needing filler, the fit is good but care is needed to align the parts correctly during fitting using the alignment of the front suspension arm mounting and rear internal bulkhead as the main guides. You should start gluing from the front (or back) and glue small sections at a time and hold the join tightly in place until the glue has ‘gripped’ to ensure the join is as tight as it can be to not leave any small gaps. Once the side panels are attached the two small nose panels can be fitted and again you must take care to align these correctly and you may need to splay out the side panels to correspond to the width of the upper panel edges (part B12). Note these front panels overlap the side panels unlike the lower floor/sidewall join and referring to reference photos will show the correct alignment if unsure? 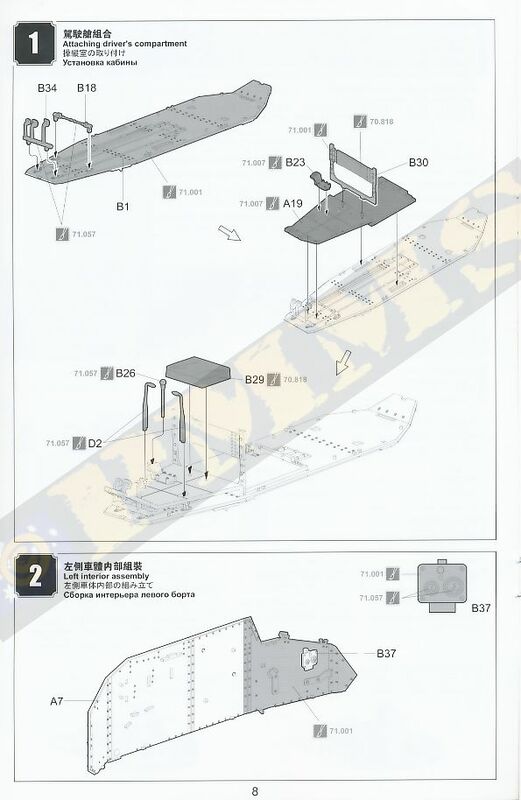 The rear hull panel and small upper panel also fit easily into place but take care to get these aligned correctly as there is scope for all the hull panels to be miss-aligned if not careful during any stage of the assembly. 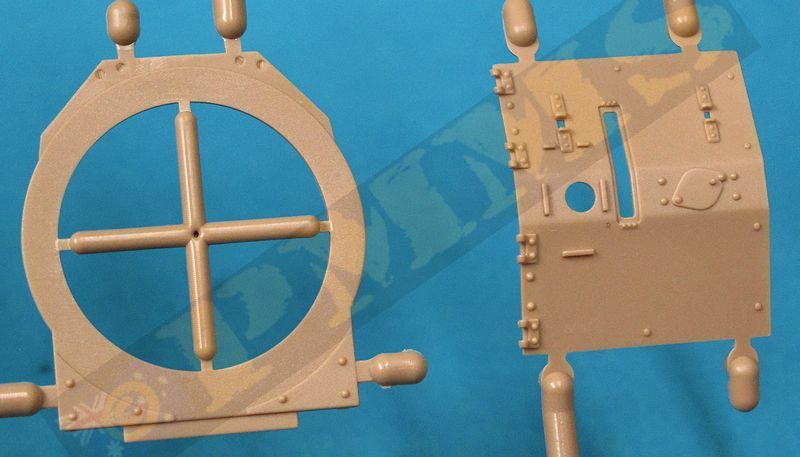 The upper hull plates consist of the forward turret ring and the separate engine deck plus the front driver’s plates with nice rivet and other details on the parts. 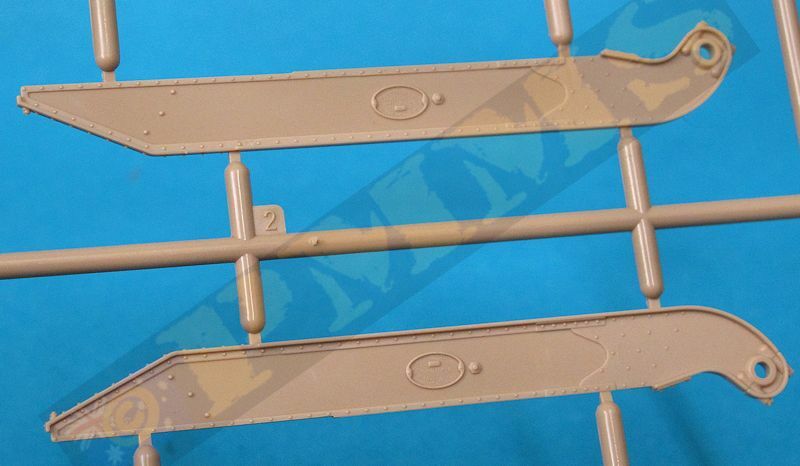 You should fit the angled plate (part A18) to the front of the engine cover before joining to the turret ring as this makes the fitting easier, when joining the turret ring and cover ensure they are aligned perfectly straight. 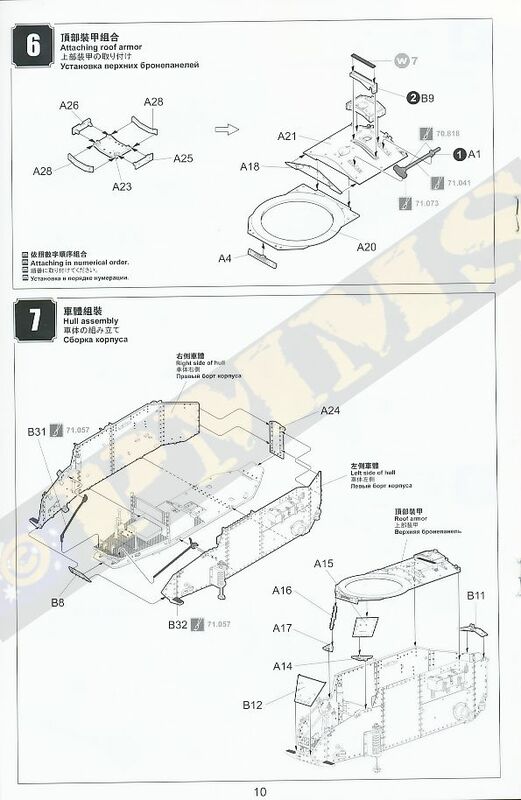 Added to the top of the engine deck is a small intake box, the two side panels (parts A25, A26) are shown in the instructions fully closed but on the rear intake these can be extended outwards leaving an intake gap, you can replicate this but positioning the panels accordingly if you wish? Also note you must attach the sledge hammer before fitting the smaller intake (part B9) which fits over the sledge hammer handle, this intake also has a small etched grill fitted. 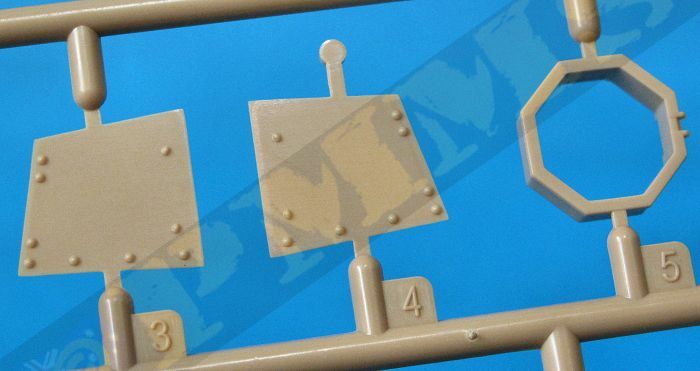 Before attaching the top hull you should fit the two small triangular hull pates (parts A14, A17) and ensure these are perfectly level allowing the glue to dry before proceeding as this will make fitting the larger driver’s plates easier. With the roof in place the two outer front plates (parts A15, A16) can be added and the fit was excellent resulting in the nice flush joins plus the small upper driver’s hatch attachment bracket which needs care to set at the right angle. The front crew hatches have nice detail free on inner pin marks and can be fitted in the open or closed position as required but if fitting closed I had to trim the edge of the left hatch to allow them to fit snugly in the closed position, if open this obviously won’t be needed. The Driver’s hatch has a small arm to hold in the open position and when closed the hatch sits over the top of the two larger hatches so don’t think it’s not fitting when as is how it should be. The large rear engine bay hatches are also free of inner pin marks and can also be posed open to display the engine and the central hatch should be fitted first as the two outer hatches overlap this in the open position, and again when fitting the hatches in the closed position a small amount had to be trimmed from the end of one hatch for a better fit, test fitting will determine if this trimming is needed with the hatches closed? 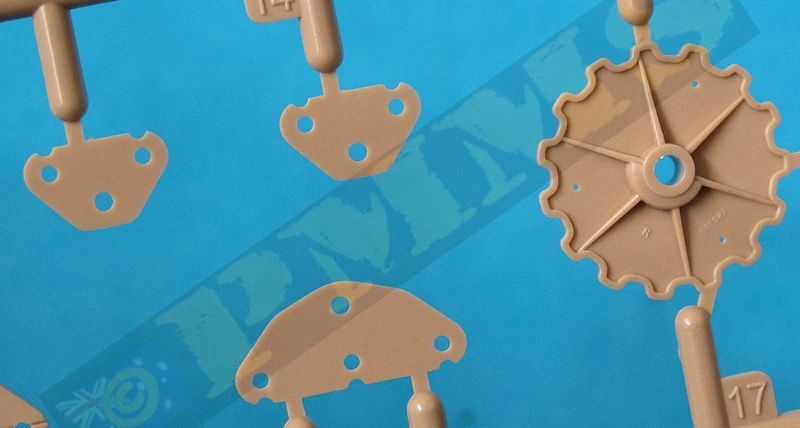 The suspension is made up of 18 small road wheels mounted in four bogie units which are designed to be movable along with another 12 smaller return rollers and removing these wheels and cleaning up the sprue attachment will need some care. 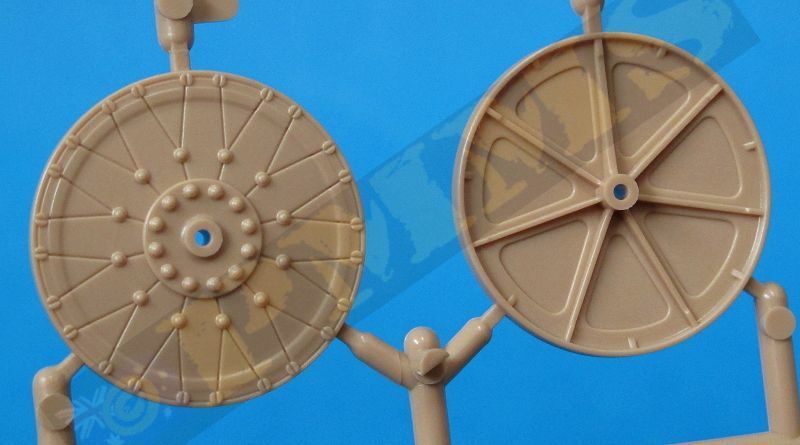 Each of the bogie units has two smaller units holding the road wheels joined by a larger bogie arm and you must take careful note of the part numbers in the instructions to assemble correctly, it is advisable to mark the parts with a fine felt pen as you remove them from the sprues as the differences are very subtle but important. 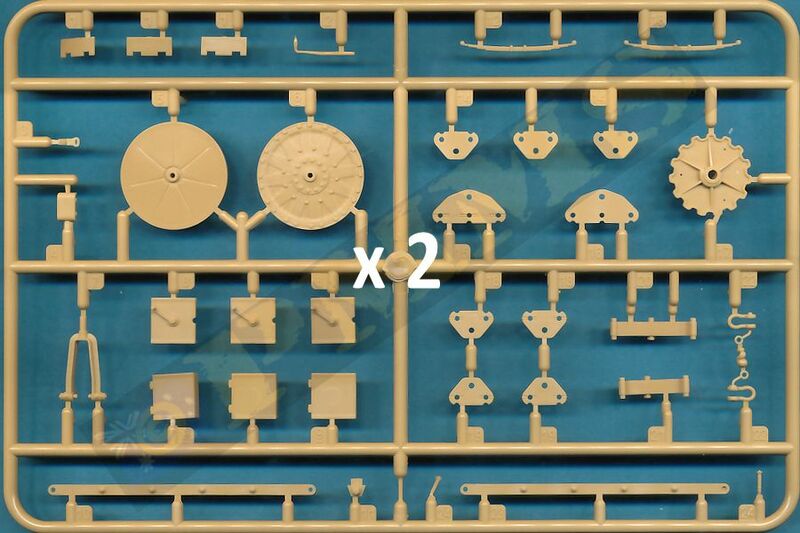 Assembly is fairly straightforward but it is easier if you glue the wheels in position within the units, this prevents them from ‘escaping’ as you assembly the units if the wheels free to move as there is no advantage having them movable in any case. I did leave the wheel units movable on the larger bogie arm at this point but glued the bogie arms (parts D20, D21) to the main suspension beams (parts C1, C3) ensuring they were perfectly level with the bottom of the beams. 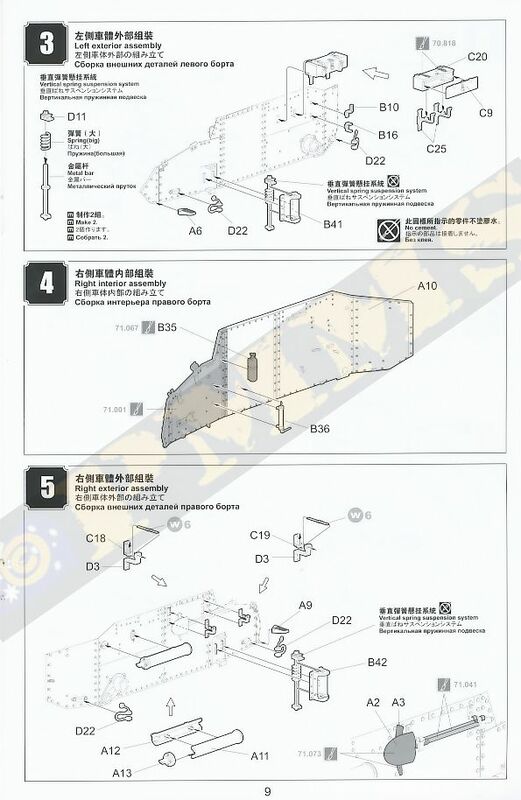 It is also advisable to mark the four bogie assemblies A,B,C,D as in the instructions to fit these in the right position. With the wheel bogie units assembled the large road wheel beams can be fitted together and these also trap the rear drive sprocket and final drive housing between the beams by way of the large sprocket pin (part E4). It is important to leave the drive sprocket and final drive housing (parts C11, C12) free to move at this stage until attached to the hull later. The outer beam has the Renault company badge included and this is very finely done with the letters fully legible along with the rivet details, it should be noted that on period photos this badge is not fitted to all in-service vehicles and in some cases on one side only so you may wish to remove this depending on the vehicle concerned if photos exist? There is also an etched lip added to the front edge of the beams, this sits on the outer lip of the beam and you must ensure it is level with the beam edges while gluing in place with cyanoacrylate. 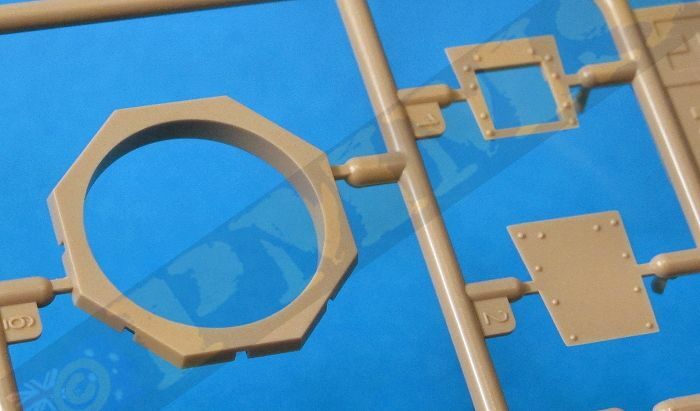 The top beam plate (part C6, C7) have two leaf springs added which are hidden inside after assembly apart from the end of the rear spring (part C17) and attaching this to the brackets (parts B39, B40) on the beam panel is a little tricky. 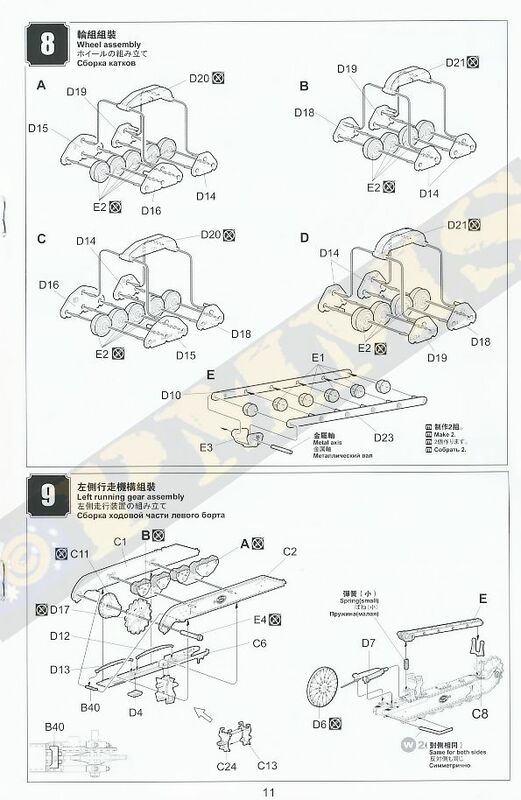 You should first glue the rear springs level with the front springs but with the end just hanging out and not attached to the brackets (parts B39, B40) at this point and let the glue on the springs dry completely before proceeding. This is because the brackets have to be added from outside the beam assembly after the top panel is attached with the springs inside, this will become clear as you do it. The top beam panel is then attached to the main suspension beam assembly the brackets added with the spring end attaching from below. 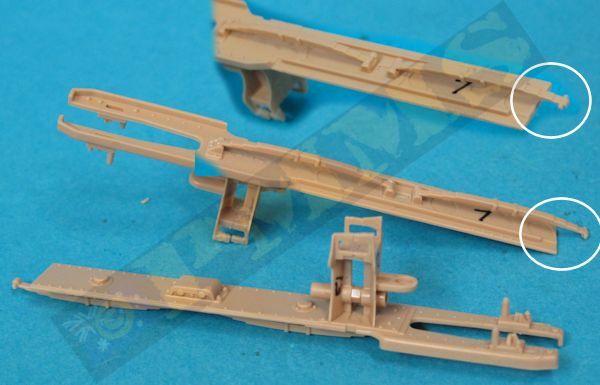 The large two part front mounting bracket is then added and some clean-up of the top join will be needed as this isn’t the best, you also need to take note of the rear bracket (parts C5, C8) positions as they are different on either side. The return roller beam assembly is again very straightforward with the smaller wheels trapped between the beams and the larger end bracket attached using the metal axle stub provided, this axle fits tightly into place without the need for glue allowing the bracket to move and the end bracket has nice details including fine casting numbers on the side. 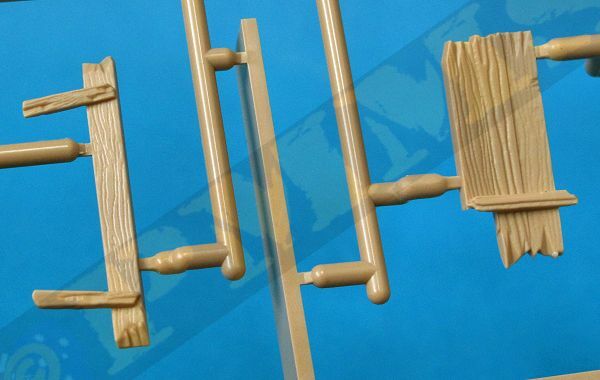 Fitting the return roller beam in place is simple with the rear clipping into the respective bracket without the need for glue and the front sitting inside the front brackets. The exact angle of the front join isn’t shown and you need to sit the beam basically central inside the top bracket just above the bracket opening while at the same time fitting the suspension spring inside the end bracket. This smaller suspension spring is again way too fine with not enough coils compared to the actual spring which is thicker gauge and replacing the spring or making one from thicker wire will improve the appearance here. 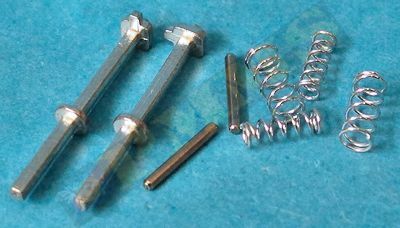 Spring provided is far too fine compared to actual suspension spring and could benefit from being replaced. 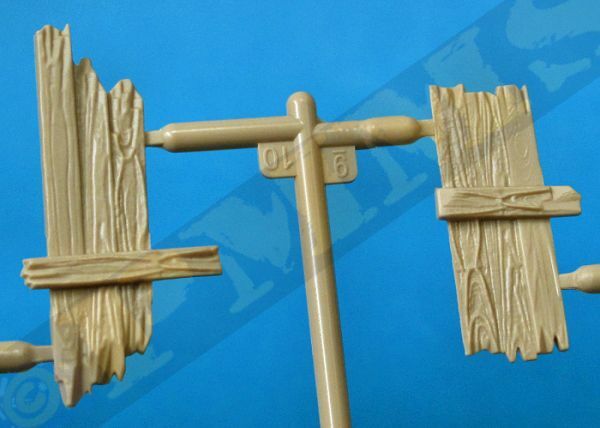 As mentioned the kit provides alternate front idler wheels, the large wooden or metal idler wheels, the wood idler has been reworked with a flush finish showing just the wooden segments eliminating the recessed and overdone woodgrain from the initional kit to better represent the wheel in scale. The screws around the outer edge have been reworked and are not as raised as on the first kit wheels but are still a little high. 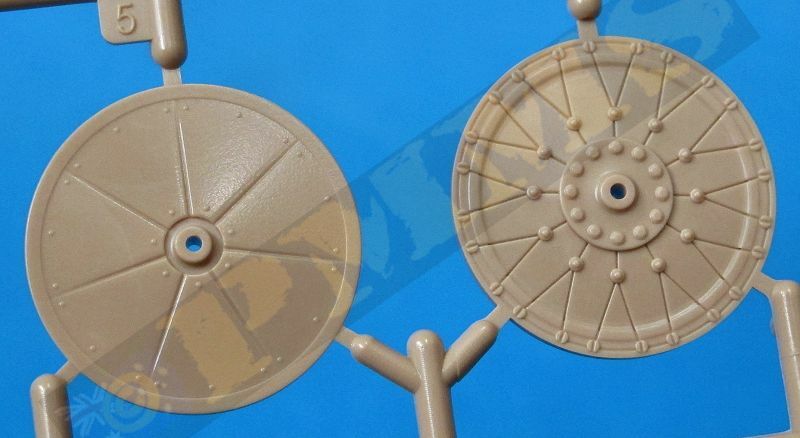 The detail on the metal idler is nicely done including the fillets on the inner faces but from period photos it appears the wood idlers are more appropriate for this model as the metal wheels appear to be used on later models. Another thing to watch which isn’t mentioned in the instructions is that the central hub bolts are different on either side of the idlers and the rounded heads should face outwards while the bolts face to the inside on each side of the suspension. The idler wheels are clipped into the large Y yoke which again has nicely done detail with this fitting into the front of the large return roller bracket and onto the mounting at the front of the road wheel beams, with everything fitting neatly without any alterations or trimming required. The suspension sub-assemblies fit the hull sides buy way of the rear drive sprocket axle stub and final drive housing, this is why the final drive must be left movable during the earlier assembly so it can be fitted to the hull mounting during this stage. The front joins onto the top of the suspension spring bracket housing with the bottom of the metal bracket fitting into the recess on the inside of the suspension beams, this results in a fairly robust assembly with positive locating points front and rear, you can glue the final drive housing into position but it’s advisable to leave the drive sprockets free to move as this helps when fitting the tracks. 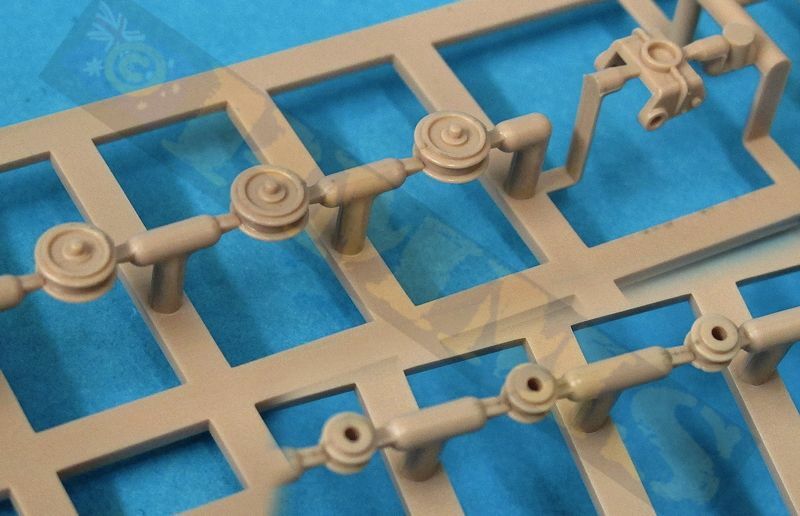 The tracks are individual link moulded in black plastic that is slightly softer then the beige plastic, the only clean-up needed is a small pour plug in the middle of each track shoe. This is raised and can be trimmed on most links but a few had a small indentation and some filling would be needed. Detail on the links is nicely done with the track shoe profile and the two brackets having the open holes and nice bolt details, the links are designed to clip together with small pins on one link clipping into corresponding holes on the next but as the plastic is a little softer this is not as easy as it sounds without damaging the pins. 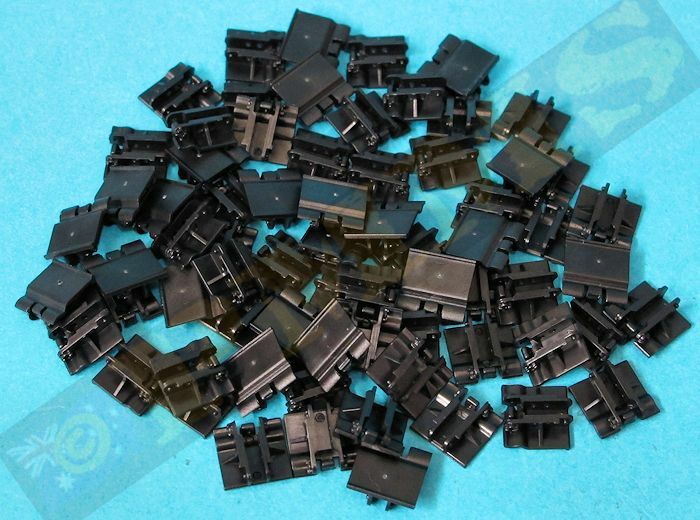 There is a small central tongue on each shoe that prevents the track brackets from being flexed to allow the pins clearance to clip into place and this makes assembly rather tricky, you can’t just force the pins or they will just distort of sheer off. After trying a few methods this appears to be the best option, holding one link firmly with one hand position the next at an angle of about 70 degrees and with the pin on one side overlapping the track bracket clip the other side pin into place while exerting pressure to slightly splay the central brackets, this only needs to be a little and at this angle the central tongue doesn’t prevent the pins clipping into place as it does at lesser angles. But you must take care as the pins can be damaged quite easily but using this method the track runs of 32 links per side went together fairly quick and sit nicely on the assembled suspension. The new riveted turret has the lower turret “ring” and 7 separate flat side plates plus the forward gun mounting plate as well as the three part cupola on the roof. 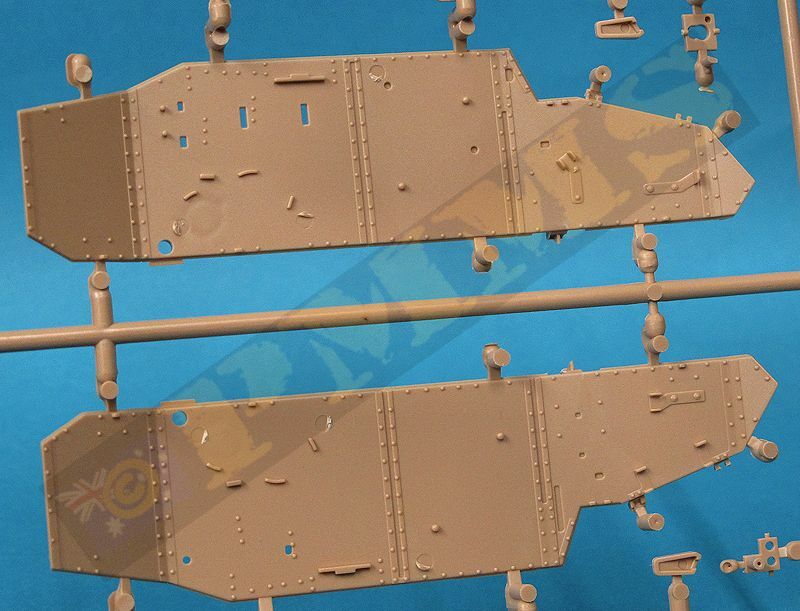 The surface detail on the turret panels is excellent with rivet and panel details on both inner and outer sides without any pin marks to contend with. 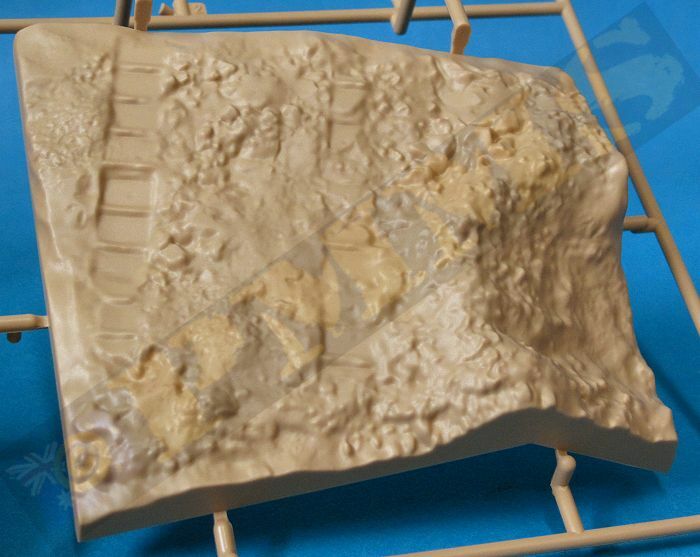 The only real clean-up is a fine mould line around the lower cupola ring (part H7) that will need care removing as there are fine rivets that need to be preserved after clean-up. Assembly is quite straightforward with each side panel attaching to the lower turret ring with a quite substantial locating lug but you must ensure each is aligned perfectly, especially the first one fitted to ensure all the others align correctly in turn so when you come to fit the last one there are no gaps. With due care the fit was perfect and I left the fitting of the front gun mounting plate till last so the gun didn’t get in the way while fitting the other panels. The two separate rear doors also have detail on both sides as well as small handles on the insides and these can be fitted open or closed as required to show off the interior. 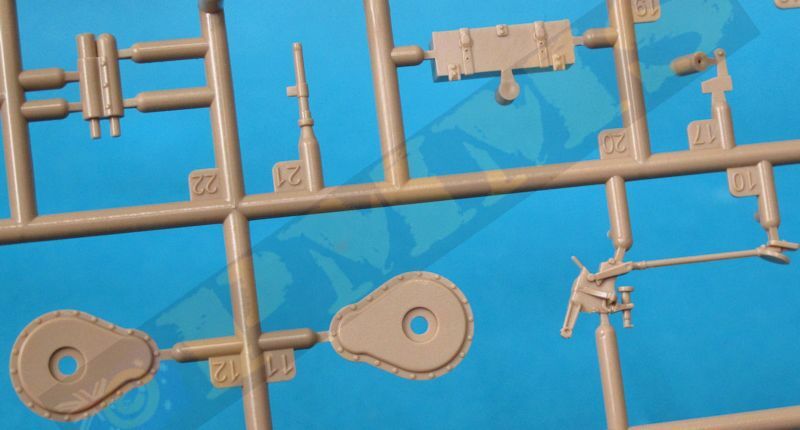 The 37mm Puteaux SA18 gun is well done with the breech and barrel assembly matching reference photos nicely, the muzzle is also hollowed out for a good appearance. 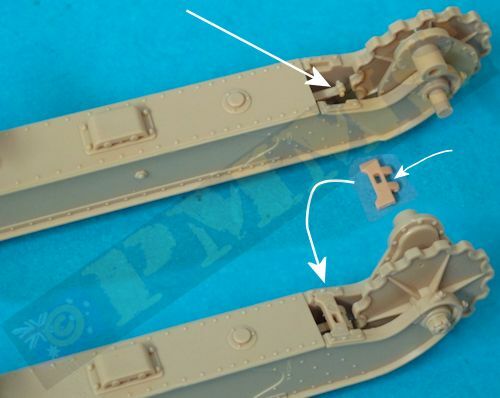 The assembled gun clips into the gun mounting ‘box’ allowing for small traverse of the gun, this in turn is held in place inside the turret front with two small trunnions (parts H16) and care is needed in using glue sparingly to allow for the gun elevation. 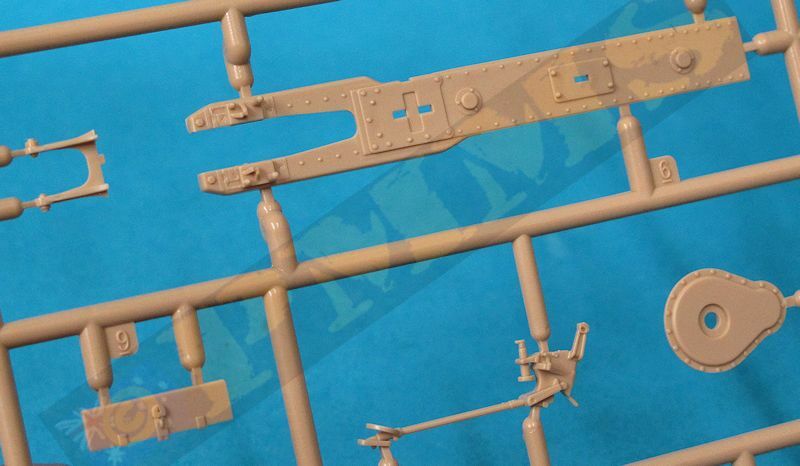 The 8mm Hotchkiss has the full gun which is nicely rendered and this clip into their respective mounting ‘box’ and secured to the turret from the same as with the 37mm gun to again give both traverse and elevation after assembly. The only other interior is the Commander’s strap seat provided in etched brass and annealing this by running the part through a candle flame will aid in a more natural bend to the seat. 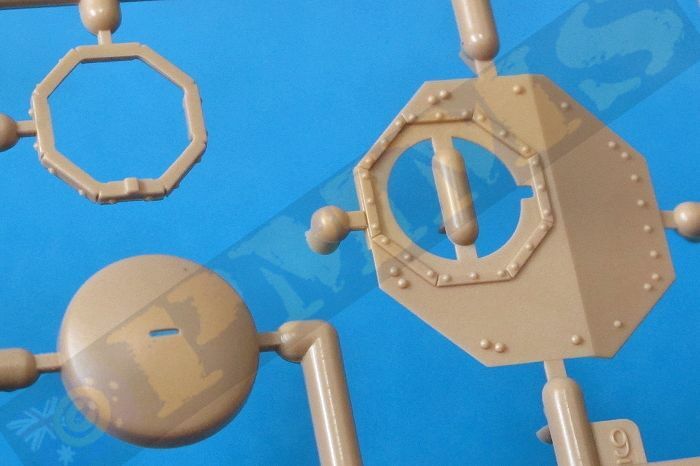 The three part cupola assembles without any problems with small locating tabs inside each part to ensure the correct orientation and the lower turret ring also fits in place without any problems. The two rear doors are separate and have nice detail on both sides free of any pin marks. The assembled turret simply sits inside the hull turret ring but isn’t secured so you need to be mindful when handling the model or the turret will come adrift. 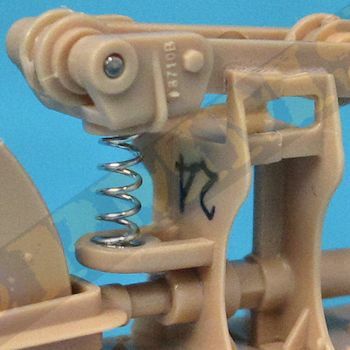 As a bonus a ground mount tripod is supplied for the excellent 8mm Hotchkiss M1914 machine gun which can be used in any setting along with a strip of 8mm rounds, note the Hotchkiss feed is a solid strip and not a flexible belt so the ammo strip supplied can be added as it comes or reduced in length depending on your preference. 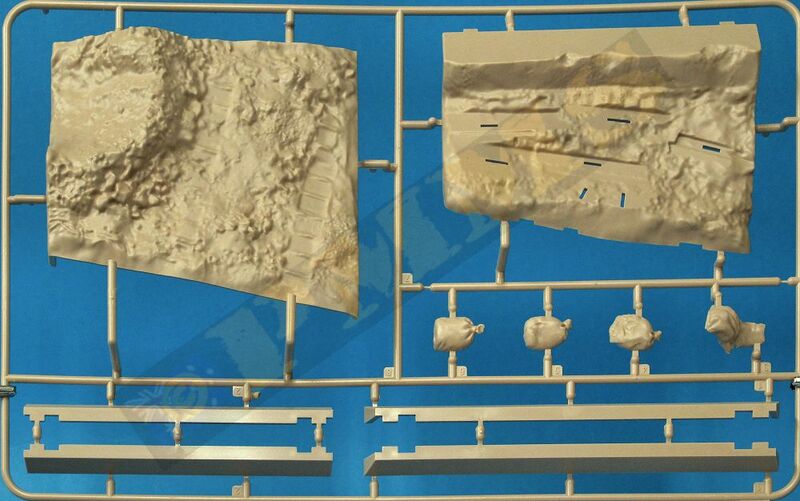 Included is a large diorama base to mount the model on if you wish and this represents a section of WWI trench with the top having rough ground texture and the “front” bits of trench wall and some sandbags, this can have additional items added if you wish or leave as is for a quick and easy display base for the model. 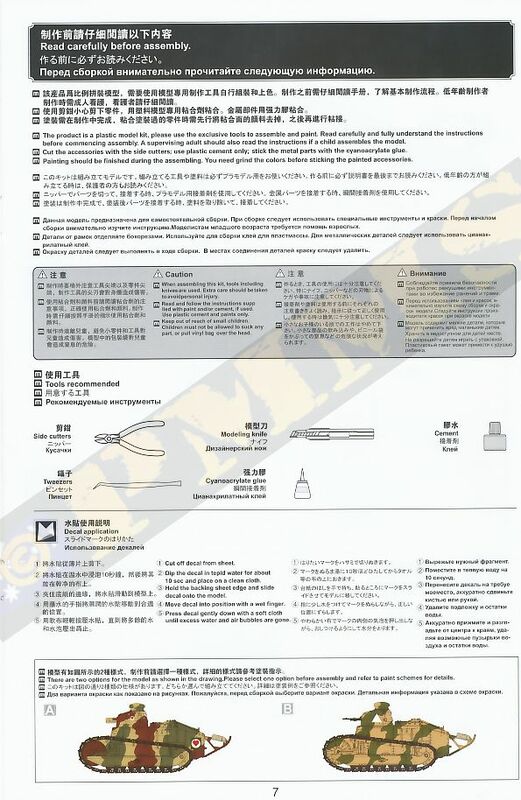 The well-produced instruction booklet has an initial 6 pages of historical notes in four languages, English, Chinese, Japanese and Russian for some of the most extensive historical notes seen in kits of late. 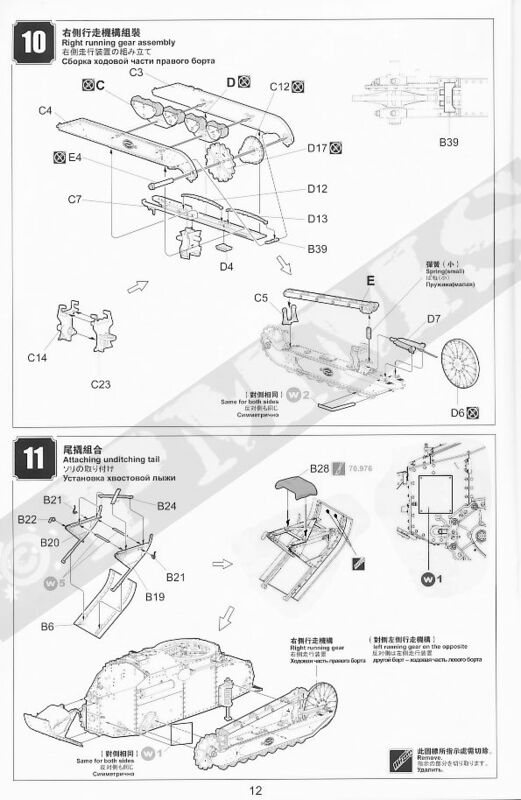 The illustrations are the usual exploded view assembly drawings in 22 steps that are well laid out and in the main clear and easy to follow even with the more complex assemble, there is the odd section such as the orientation of the idlers and the inner suspension springs that can cause confusion but overall they are well done and I didn’t find any miss-numbering “bloopers”. Paint numbers for Vallejo colours are the only paint references provided as used during the construction. 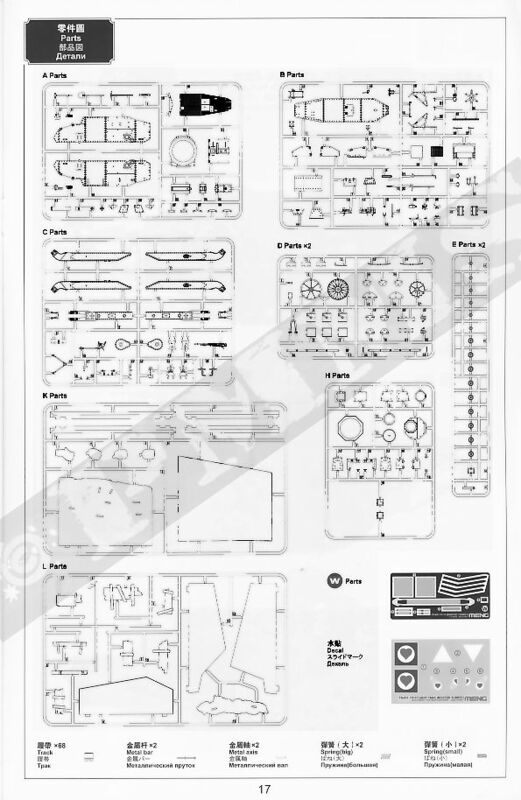 The decal sheets is nicely printed and has markings for just two vehicles as listed below with the schemes shown in colour in the instruction booklet five view illustrations of the two vehicles. 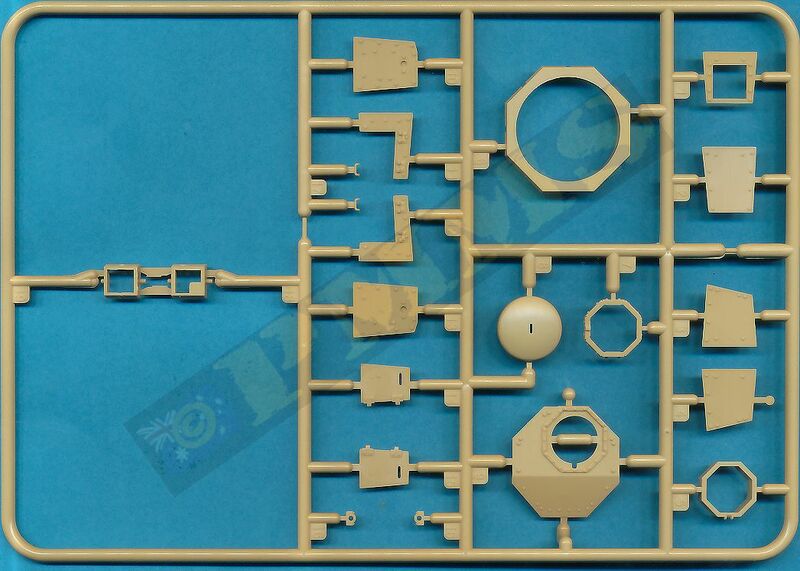 As with the first kit, this is an excellent representation of the definitive Renault FT with extremely clean and blemish free mouldings as well as being dimensionally accurate and very well detailed with the excellent hull and turret surface texturing and rivet/bolt details (taking into account some hull rivets shouldn’t be perfectly round). The only major issue is the suspension springs provided which are way too fine and replacing these will enhance the details. 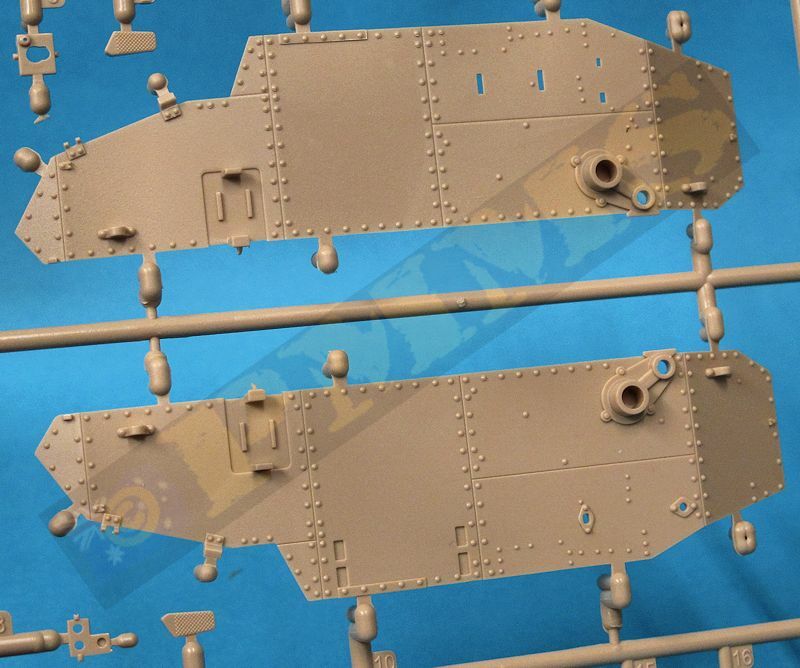 The inclusion of the full Driver’s compartment which can be shown off to good advantage by the large front hull hatches makes for a highly detailed model. 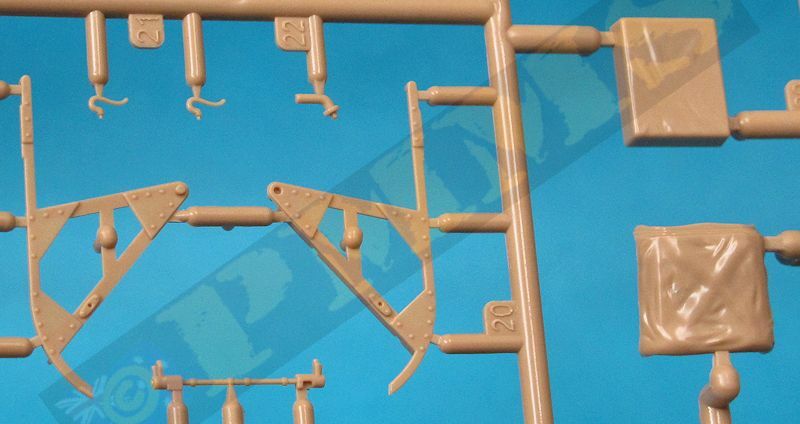 The inclusion of the Hotchkiss MG ground tripod is a nice bonus to utilise the excellent gun if not fitted into the turret and the diorama base adds another option to the kit.